This charming one story home within walking distance of the University of Redlands is based on the design principles of the Arts and Crafts movement. 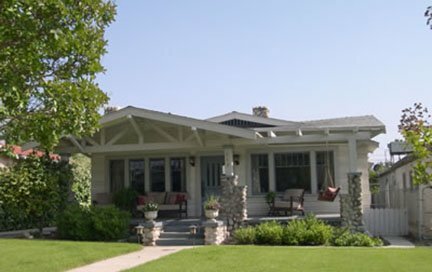 With its low pitched roof with wide overhanging eaves, gable detailing and welcoming front porch, it is a classic example of the bungalow style of the early 20th Century. 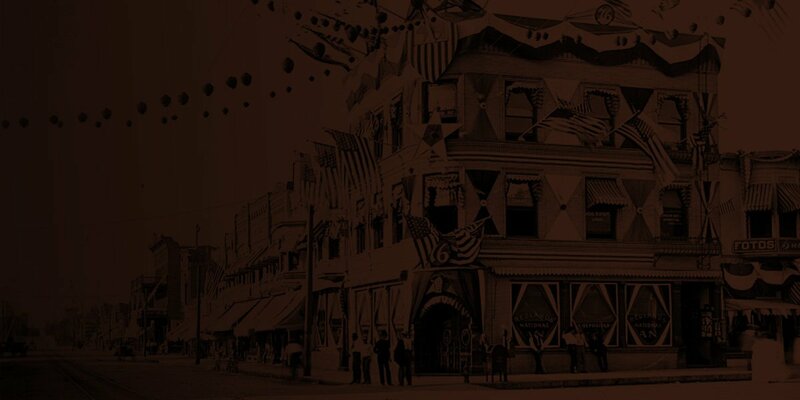 In 1907, with the establishment of the University of Redlands, founders realized the need for residential housing near by. The Redlands University Tract #1 was surveyed by Issac Ford and recorded in September 1909. The boundaries were Brockton, Colton, Church and University. On December13, 1910, C.C. Reasoner was issued a building permit for a 5 room, 1240 square foot dwelling at 824 College in the newly established Redlands University Tract #1. The estimated cost was $1900. On September 15, 1911 a permit was issued to F.H. Milton for a 224 square foot wooden garage with an estimated cost of $50. The 1911 city directory listed both men as builders. The house is approached by a straight concrete walkway with stairs leading to a centered front door with four glass panes above a shelf which is supported by square blocks. The door leads directly into the living room which is common in many bungalows. The windows are grouped in same sizes with small symmetrical windows over large open windows. The street facing gable with its decretive openwork is supported by rock piers and square wooden pillars. At the top of each gable, symmetrical wooden ventilation slats appear. The exterior rock chimney with symmetrical adjoining windows is another example of the bungalow style. The most common siding of the period was clapboard and on this home it was applied with an unusual artistic pattern. Although the detached single garage no longer exists, the ribbon driveway typical of the period remains. San Bernardino County tax records indicate Marshall A. and Mary E. Rugg as the first legal owners of the house in 1914. Mr. Rugg was in the citrus business. City directories listed the couple and their daughter Myrtle living at Clifton and Sunnyside which suggests they purchased the property for rental purposes. Marshall and Mary Rugg owned the house for 14 years. The property was purchased by Charles and Grace Dostal in 1928. Mr. Dostal was a sheet metal worker at Merrills Tin and Sheet Metal. The Dostals had been tenants of the Ruggs and occupied the house until 1948, when it was purchased by Herndon and Louis Fields. Mr. Fields occupation was as a sheet metal worker. They lived in the home until the mid 1960s. As many as nine owners and many renters have occupied the College Avenue property since 1914, but it remains authentic to the principles of the arts and crafts movement. The Redlands Area Historical Society is pleased to present the 2009 Heritage Award to Ian Hay and Laura Tracey for their continuing effort to maintain the authenticity of this charming bungalow style home.